Archaeological fieldwork in the inter-tidal zone of the Severn Estuary over the past twenty years has revealed a rich landscape of prehistoric settlement. This latest volume by Professor Martin Bell presents the evidence for the Bronze Age, focusing on sites at Redwick and Peterstone in the Gwent Levels. At Redwick, a settlement of four rectangular buildings, defined by well-preserved timber posts dating to the middle Bronze Age (1600–940 cal BC), is surrounded by footprint-tracks of animals and humans. Peterstone and other locations in the estuary have revealed a variety of wood artefacts and structures, and features such as fish traps, trackways and sites of seasonal encampments. The relationship between the wetland and dry ground settlements around the estuary is explored in detail, through artefacts, pollen and stable isotope analysis. The author concludes that there is clear evidence for transhumance throughout the Bronze Age. 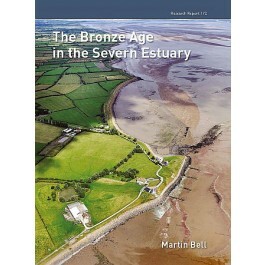 In the final chapters the author compares the Severn Estuary with other coastal sites of the Bronze Age in Britain and continental Europe.